I’m basically obsessed with these breakfast parfaits right now. I am loving the fresh diced apple combined with the hearty organic yogurt (full-fat plain for me) and rich, cinnamon-infused granola! Apples are one of those fruits I generally take for granted. They are a staple in my diet for most of the year, except for summer, when I let them go and enjoy all of the warm-weather stone fruits and berries. The rest of the year, I do adore my regular snack of sliced apples and peanut butter, a much-anticipated mid-morning sojourn during my dreary day-job hours. But otherwise, I’m kind of like apple, you basic! Yes, you’re cheap, locally grown here in Michigan, and nutritious. But why do I gotta swathe you in PB to make you taste good? Lately, however, my taste buds are interpreting apples in a whole new way. I am just LOVING their flavor! It doesn’t hurt that they are currently in season, making them especially fresh and delicious. 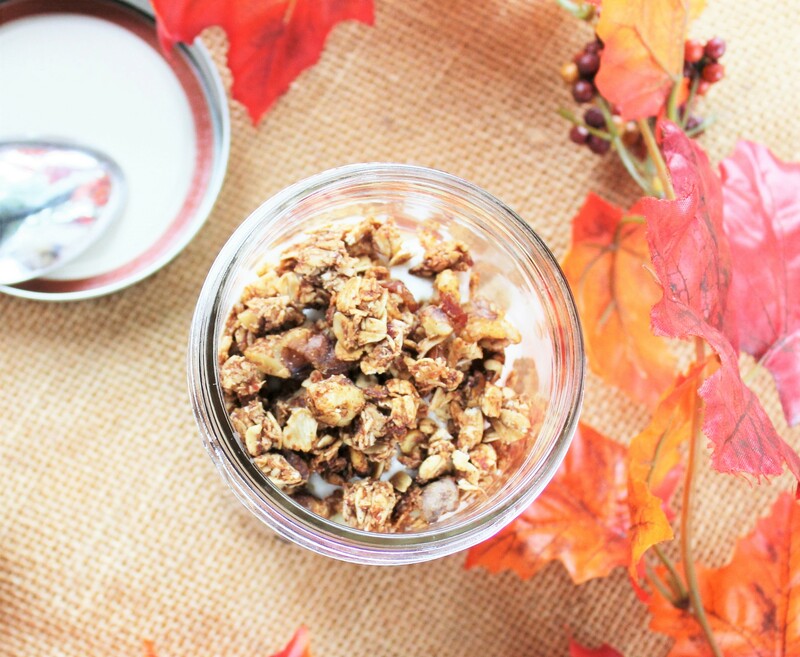 They are so perfect in these yogurt parfaits, crisp and tart, providing a great complement to the sweet granola. I find myself musing over what else I could add them to: of course salads, but perhaps pizza, too? Maybe diced into a quinoa bowl? Or baked and drizzled with honey and cinnamon for a sweet but healthful dessert? It’s gonna be apples all day in this house for a while! BTW, my fave apple variety? McIntosh, which I’ve bought almost exclusively for years (and used in these parfaits) by merit of their thin skin and enhanced tartness and crispness. Submerge the dates in a bowl of hot water; soak for 15 minutes, until soft and water-bloated. If they seemed relatively moist and sticky to begin with, this should be adequate. But if they are dates you’ve had a while that are more dried out, dump the water after 15 minutes, add fresh hot water to the bowl, and let them soak for another 15 minutes. Then remove them and reserve the water. Add the dates to a food processor or blender with three tablespoons of the water they soaked in. Process well, until a smooth paste forms. You may need to add another tablespoon or two of water during this process to enable this mixture to form a smooth consistency. Once it has, set it aside for the granola sauce. Next, in a large mixing bowl, combine the dry ingredients: the oats, walnuts, coconut flakes, and sea salt. Now it’s time to make the sauce. Add the date paste, honey, coconut oil, vanilla extract, and lemon juice to a small saucepan over medium-low heat. Bring to a slow boil, stirring frequently to avoid the sauce from sticking to the bottom of the pan, then reduce to low heat. Let cook and thicken for three minutes, stirring constantly during this time frame. Then remove from heat, stir in cinnamon, and immediately blend with the dry ingredients, coating them evenly and thoroughly. 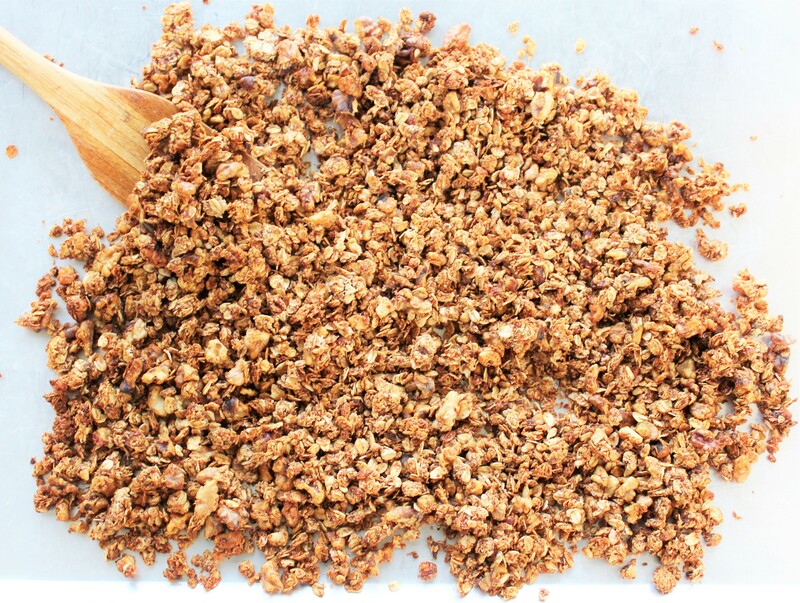 Spread the resulting granola out onto a large cookie sheet and let bake for 45 to 60 minutes, taking it out and stirring it every 15 minutes to ensure it cooks evenly. The granola will be done when it is crunchy but not burned. As long as it seems like most of the moisture has been wicked out of it when you remove it from the oven for good, it should be fine. It may not seem wholly crunchy immediately, but once you let it cool, it will be if it has been baked adequately. And you’re done! Slam a lid on that baby and stick it in the fridge, or enjoy it right in the moment (who cares whether it’s actually breakfast time???). If you’d like to make multiple parfaits ahead of time, they will store well in the fridge for several days.